by Laura from Louisville, Miss. My week in Haiti was the most heart breaking and life changing experience of my life. Other than the births of my two boys, I have never loved so deeply or so quickly. At the same time, I’ve never felt so overwhelmed by the need surrounding me. The children stole my heart from the time we crossed the border as they ran alongside the trucks waving and smiling. Their immediate trust and quick laughter warmed my heart and made me wish we could all be so quick to love and let others into our hearts. The adults embraced me with smiles and greetings that transcended our language barriers. I learned very quickly that smiles and laughter are universal languages – no interpreter needed. Despite the hot, dry and bleak conditions, most of the people were joyous and grateful for the help being provided to their community. Part of the team spent our time building five classrooms for the school that opened on The Promise Land site in October. The thought of providing the means to educate children and hopefully enable and empower them to improve their way of life for themselves and generations to come brings great joy to my heart. The teacher who oversees the school told Tim (Executive Director of HMM) that he wanted to teach the children three things: to read, to write and about Jesus Christ. I can’t think of a better mission for a school. One of the things that struck me most about the classrooms was the order that ensued once the kids were inside those walls. Out in the open, the kids were wild (as most kids are!) and any effort to give them anything or do almost any kind of organized activity often resulted in…well, pretty much chaos. 😀 Inside the walls of their classrooms, however, they sat quietly, waited their turns and were polite and orderly. It was amazing! It really made me think about all the times I’ve wanted “freedom,” but God gently gave me “walls” to reign in my energy and efforts. Sometimes what feels like walls to limit us are actually walls to protect us. 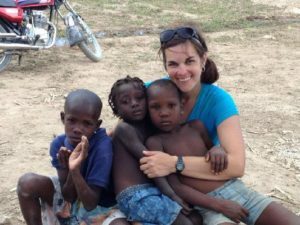 My time in Haiti taught me to thank God for the times He’s reigned me in to protect me from myself.